The ten Auspicious Asterisms are all pairs of otherwise unremarkable stars, except for one that is comprised of four stars. The Arabic term sa’d indicates good fortune or something that is auspicious, especially a star. 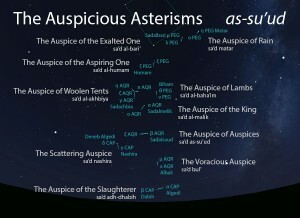 All located within the same region of sky, the Auspicious Asterisms begin to set just before the Two Vultures (an-nasran) set. When the calendar of lunar stations was generated, the pre-existing Auspicious Asterisms that were located closest to the Moon’s path were incorporated as lunar stations. 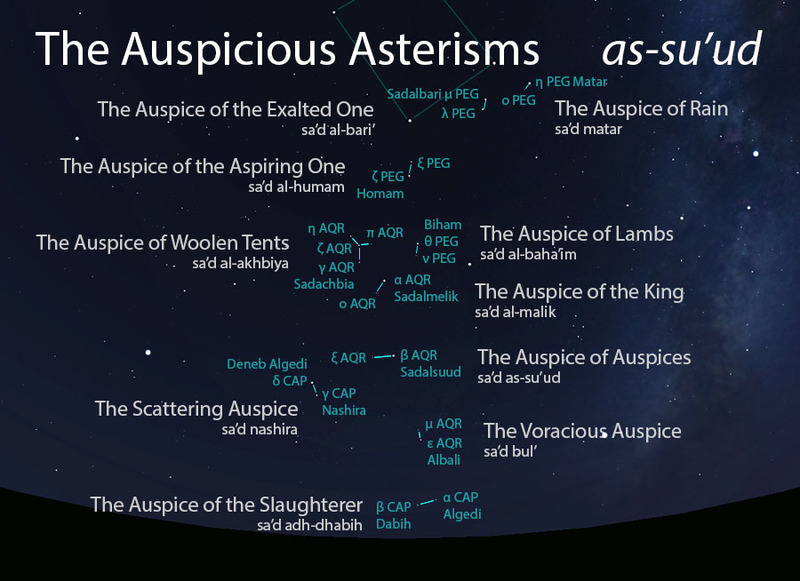 The Auspicious Asterisms (as-su’ud) as they appear setting in the west about 45 minutes before sunrise in early August. Sky simulations made with Stellarium. The ten Auspicious Asterisms are all pairs of otherwise unremarkable stars, except for one that is comprised of four stars. The entire set of ten Auspicious Asterisms rise within about a month but set over the course of two months. Today we can expect to observe the Auspicious Asterisms setting in the west (about 45-60 minutes before sunrise) from early August through early October, as seen from the latitude of Tucson. Likewise, they rise from early February through early March. The celestial complex of the Auspicious Asterisms comprises four lunar stations. The earliest listings of the lunar stations were later adjusted backwards by two stations to adjust the calendar to begin with the vernal equinox. In what follows below, the earlier order is listed in parentheses.